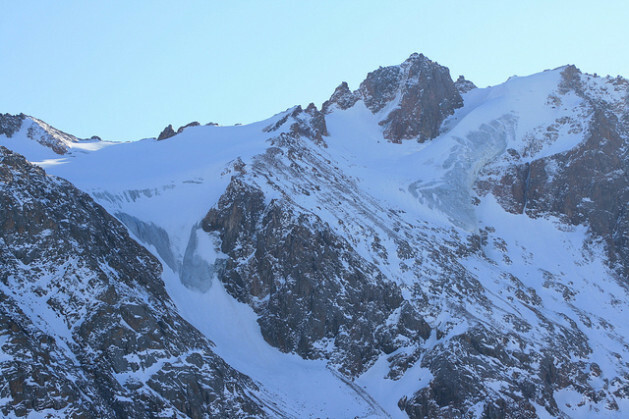 High glaciers such as this one in the Tian Shan mountains in Kazakhstan are said to be safe from global warming. But talk of agreements to reduce the emissions of greenhouse gases that cause global warming appears to be fading at COP, replaced by proposals to turn to the private sector for loans to support adaptation to climate change. Credit: Christopher Pala/IPS. WARSAW, Nov 15 2013 (IPS) - As deliberations continue in earnest at the 19th United Nations Conference on Climate Change in Warsaw, negotiators from the Global South welcome a focus on financing adaptation – but reject a new emphasis on a role for the private sector. Climate negotiations have now dragged on for almost 20 years. Talk of “fair, ambitious and binding” agreements to reduce the emissions of greenhouse gases that cause global warming appears to be fading, to be replaced by proposals to turn to the private sector for loans and investment to support adaptation to climate change at what has been dubbed the “Corporate COP (Conference of Parties)”. Tosi Mpamu-Mpamu, a negotiator for the Democratic Republic of Congo and a former chair of the African Group of negotiators, sees an alarming change emerging in the approach to funding the response to climate change. At the Copenhagen climate conference in 2009, developed states pledged 30 billion dollars of new aid for climate finance for the developing world between 2010 and 2012, and a further 100 billion by 2020. “Developed countries are now shifting the responsibility to provide funding to the private sector, a dangerous trend to these negotiations,” said Mpamu-Mpamu. Other negotiators share Mpamu-Mpamu’s concerns over the role transnational corporations are assuming at the conference. “At a three-day conference prior to this COP, businesses spent two days explaining how they could make money out of climate change,” said Rene Orellana, head of Bolivia’s delegation. And, said Pascone Sabido from the Corporate Europe Observatory, the corporations assuming prominence at the COP are also the biggest emitters of carbon. He criticised the U.N. for accepting sponsorship for COP19 from major polluters like steel giant ArcelorMittal and the Polish Energy Group (PGE), saying these companies were influencing the negotiations. Developing countries at the U.N. Climate Conference in Warsaw deny that they have abdicated their responsibilities. The EU claims to have a proven track record of delivering climate finance to developing countries. An official of the European Commission said, even though the fast start finance period has ended, EU climate finance continues to flow. He said last year in Doha, the EU and a number of member states announced voluntary climate finance contributions to developing countries amounting to 5.5 billion euros from their financial provisions. “They are on track to deliver this amount in 2013,” he said. The EC further claimed that since 2007, when the 28-member state organisation launched the EU Blending facilities that combine grants with loans, the EU has committed 480 billion euros to more than 200 climate-relevant initiatives. “You wouldn’t ask Marlboro to sponsor a summit on lung cancer, so why is it acceptable for the U.N. Framework Convention on Climate Change?” he said. Rachel Tansey, a freelance writer and researcher on environmental and economic justice issues, says big business wants to see climate finance – public funding – directed towards projects that corporations can profit from. And the governments of the developed countries are listening. “[Transport and energy giant] Alstom is lobbying for so-called “clean” coal, controversial technologies that allow them to continue profiting from burning fossil fuels, like carbon capture and storage, and for more nuclear power,” said Tansey. But COP19 president Marcin Kolorec said there was nothing wrong with inviting the private sector to participate in parallel meetings at the conference. He said industries have been given a chance to take part in the same way that non-governmental organisations are, adding that such dialogues have been a feature of the talks since the COPs started. “We have to be transparent and inclusive,” he told reporters, adding that the Warsaw talks were a build-up to a possible global agreement in 2015 in the French capital, Paris. He said industries were given a chance to participate at the COP just like non-governmental organisations, adding that such dialogues have been part of the COP since it started. He said there is no chance that industry will influence COP decisions because they are not part of the formal negotiations. Swaziland’s Emmanuel Dlamini, the chair of the Africa Group of negotiators, said that despite some risks, bringing business on board is not such a bad idea. “For developed states to come up with the finance, they need to mobilise the business sector,” Dlamini told IPS. For Dlamini, the main challenge is to clearly define climate finance. Since the Copenhagen conference, he said, a lot of aid to developing countries has been classified as climate assistance. “Yes, there has been money flowing, but to what extent is it climate finance?” wondered Dlamini. In Swaziland, for instance, he said, money coming from the European Union’s Official Development Assistance for poverty alleviation is now considered climate finance. “We need a reliable fund for climate change like the GCF,” said Dlamini. Meena Raman, from the observer group Third World Network, says completing the setting up of the Green Climate Fund would be helpful because it is a grant fund that will directly benefit poor countries. Presently headquartered in South Korea, with operational funding of just seven million dollars, the Green Climate Fund does not as yet have a cent for projects. “That’s where developing countries are saying the 100 billion dollars should go to, a matter still under discussion,” said Raman.